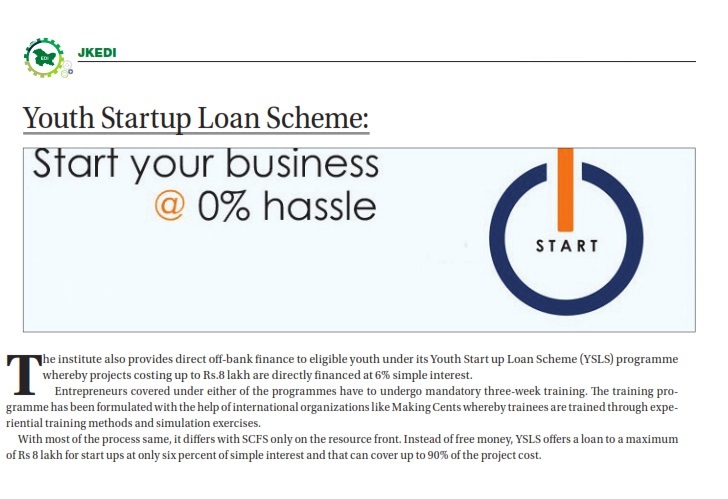 The institute also provides direct off-bank finance to eligible youth under its Youth Start up Loan Scheme (YSLS) programme whereby projects costing up to Rs.8 lakh are directly financed at 6% simple interest. Entrepreneurs covered under either of the programmes have to undergo mandatory three-week training. The training pro-gramme has been formulated with the help of international organizations like Making Cents whereby trainees are trained through expe-riential training methods and simulation exercises. With most of the process same, it differs with SCFS only on the resource front. Instead of free money, YSLS offers a loan to a maximum of Rs 8 lakh for start ups at only six percent of simple interest and that can cover up to 90% of the project cost.